One of the most common questions I get here at Simple Pin concerns images. Everybody wants to know how to create stunning visuals for their page, and so today I have a returning guest here to talk about creating Pinterest images that will get you clicks. Cassie Johnston of Wholefully joined me on Episode 7 of the podcast to talk about using Amazon affiliates to boost your blog income. But the thing about Cassie is that she has some seriously stunning images on her Pinterest page. For example, check out this smoothie pin that went completely and totally viral, and this simple but amazingly gorgeous pin for flavored water that has been pinned and repinned thousands of times. When that smoothie pin went viral, Cassie heard from so many people that had come to her blog for the recipes she was writing about. Many of them told her that they felt stupid asking how to make smoothies, like it was something that people just “know”. This opened up a whole new market to Cassie, one in which she could create a series of posts on baseline recipes (e.g., overnight oats, infused water, and juicing) to help people eat more healthfully. She modeled new pins after the one she had created for the smoothies since it was so successful. Part of the allure of these types of pins is that the associated post promises more than one recipe. But rather than the reader having to click through multiple pages of the blog to get all the recipes, they are all right there in one post. We talked about this same strategy recently with Melissa from Bless This Mess, who is also using the multiple recipes per post formula to gain long-term results on Pinterest. The reader feels gratified that they aren’t having to click all over the internet to get a couple of recipes that were promised in a pin. When your reader is happy, they share your content more. The other benefit to both you and your reader is that if they don’t like one of the recipes, the entire post isn’t wasted on them. Take Cassie’s smoothie post for example. Someone might not care for one or two of the recipes in the post, but if they like the others, they are going to share the post. So it allows you to reach a larger audience just by adding a few more options to a post. If you are just getting started with creating Pinterest images, where do you start? How do you get to a point where you can create gorgeous visuals like Cassie? When Cassie was in high school, she began playing around with graphics. She loved creating images and computer wallpaper for some of her favorite bands, (NSYNC, anyone?) When one of her teachers saw some of her work, she shared with Cassie that it was a viable career option. She did end up getting a degree in graphic design, but she doesn’t want that to scare anybody away from creating their own images! So while she does have the graphic design degree, Cassie has never taken any type of photography course. She is entirely self-taught and believes anyone can do that. If you have a desire to improve in that skill, you can definitely do it. What If I’m Not Interested in Learning to Do It? Let’s be honest though, not everybody wants to do it. I am not creative at all, so I hired out this task fairly quickly for myself. We need to recognize that there is value in knowing which things we want to do and which things are going to feel like “walking through mud”. And we have to be willing to give up or hire out the things that don’t bring us joy or that take us so long to complete that it negates any value that might come from it. If you do design your own images and are feeling like you just need a little extra help, we offer 30-minute Image Consultations here at Simple Pin. 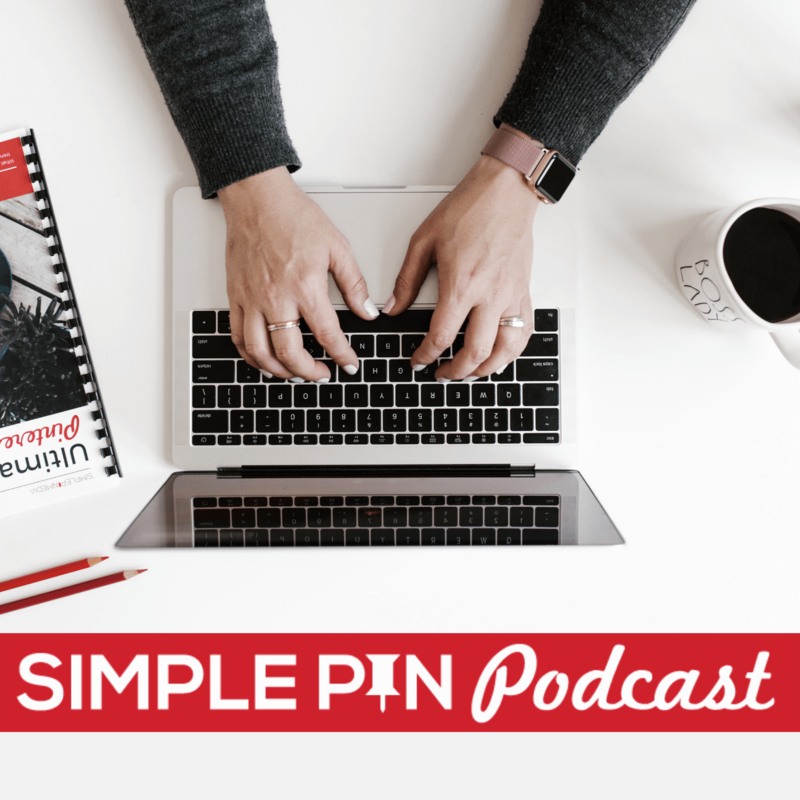 We will help you make sure you are up to date with Pinterest’s best practices, give you action items and tips for taking your pins to the next level and more. If you just want someone to DO IT FOR YOU, we do that as well. We can design images for a new product or course you are launching, to help you A/B test on a high-performing post or create extra images for older content. With so many balls in the air in your business, this is one you can feel confident handing off. Check out our Simple Pin Images service here. Back when Cassie was still creating those images in high school, she was using Photoshop. Now 15-20 years later, she is still using Photoshop. She admittedly “doesn’t know how to use 75% of what’s in there”, but she uses it because she believes that you have to be ready to embrace professional level software if you want professional images. Using software such as Photoshop. Lightroom, or Adobe Premiere (for video), will give you the flexibility you need to create the types of images you need to create. Creative Cloud makes the process easier by making all of the software available at one price per month for access to everything. Websites like Lynda offer training for every sort of software you can imagine, so learning to use pro-level image creation tools is truly possible for everyone. We have found over the past year that sites that feature branded images get more clicks than those that don’t. The thing is that most bloggers began their blogs as a hobby and realized at some point that they now have a business which needs a brand. Most businesses begin with the brand, but if you didn’t, don’t worry. It’s not too late to get things in place. Cassie didn’t have a true brand for her first five years of blogging. She was the brand. She had to consider what information she was most excited about sharing and what type of content she wanted to put out. Those decisions are what helped to shape her brand. Your visuals should represent what your brand is about. So if you are confident that you want to blog about down-home, country cooking, think about what types of visuals will draw your target audience in (things like distressed wood, warm colors, worn wood props, soft lighting). For example, think about the visual experience that you encounter in a restaurant that serves the type of food that you are blogging about. Keep in mind that as a blogger, you serve as a resource for people and are likely perceived as an expert in your area. Consistency in branding is key to maintaining that seat of expertise. If you want more guidance on creating a branded style for your blog, website or product page, you might be interested in this great freebie from Elite Blog Academy, Branding Your Blog. So many great tips for creating a cohesive look with your images and fonts and across all platforms. What is the best size image to use for Pinterest? UPDATE April 2018 — Pinterest has now said that images longer than 1260 will have lower rates of distribution. Stick with 600×900 to be safe. And the second most asked question we get is…..
Do the tall, stacking collages still work better than a single image? When Pinterest changed from the small, horizontal images to the vertical images, some users began using collage images. A stacked collage is where there is a photo on top, then text in the center, then another photo on the bottom. These exploded on Pinterest and have remained very popular for a while now. Cassie shared back in Episode 7 that her guiding principle for everything she shares online is, “Is this helpful?” In design school, she was taught to never add something to a design just for decoration. Everything should serve a purpose. So if you have information to convey that would be most helpful by using a collage image, by all means, use it! Another reason you might want to use a stacked collage is if you have older content that has smaller, horizontal images. You can stack those to make a vertical image. But don’t make collages just to fill space. It can be overwhelming to the Pinterest user and if it isn’t serving a purpose, you don’t need it. Are you a person who loves variety? Do you have trouble sticking with one thing simply because there are just so many awesome things out there to try? If so, maybe fonts are a sticky point for you. Maybe you don’t understand the need or why anyone would use just one font for all of their images. Cassie says it should be a priority to choose a font that is easy to read, not decorative, and not visually overwhelming. Bebas is one of Cassie’s favorite fonts to use. It’s a great starter font and it is free. Keep in mind what we have stated repeatedly: you want to add value to your images, so don’t slap text on them just to have text. Use your text wisely. If you have a recipe post, don’t just put the recipe name on there. Promote your post via your text. Cassie gives some great examples of how to do this in the episode. Be sure your text has margin so it has “some room to breathe”. Don’t cram text in there. The more white space you have, the more professional it will look. 11:40 What if I’m not interested in learning to do it? Thank you both Kate and Cassie, these are great insights from someone who has lots of experience on Pinterest. I appreciate it! I agree with most of the tips, from my experience. Definitely, branded images will get you more clicks. Checked her pins and boards and they are awesome. She is covering some interesting niches. Great insights that I can’t wait to use! Indeed Pinterest can be very useful social media platform for promoting our business over all. Choosing a branded images is the key to success. It helps us to get more clicks. What does “hidden images” in a site mean? It means you can ‘hide’ and image in the post and when they click on the pin it button it pull that image. So it’s not seen but is used for share purposes. What program does one use to add text inside of a stock image before posting to Pinterest? You can also use Adobe’s “Spark Post” which does auto mixing of layouts etc. It’s a mobile app and awesome. I believe you don’t need to have an Adobe ID or anything because you can signup through Facebook or Google. Kate, the main point that stuck out for me was the “Beautiful Design”. I’m a fledgling business and I am more than aware of the benefits of using Pinterest. I’m just not very good at it. I think the key is to make a picture that grabs the eye. I’m guilty of using too much colour personally, and it’s something that I need to change! I definitely want to take the idea of ‘less is more’ and really create beautiful pictures to sell myself. I just found your podcast a couple of weeks ago and I’m really loving it! I’ve been blogging for awhile, but haven’t really gotten things to take off yet so I’ve looked at lots of information and yours is really different from the standard advice that’s easy to find. Thank you! For anyone who takes Cassie’s advice about using Photoshop and Lightroom, be sure to also take her advice about training. Lightroom especially is not user-friendly for a novice. I took a class from a local photographer to learn the basics of how to get it set up, and it was worth every penny. I´m still too scared of the Creative Cloud software and they kind of run slowly in my laptop but I can handle Pixlr and you can still do great things. Awesome podcast! I just wanted to leave my bit of advice. Absolutely love the content here and will start listening. I’m just starting out in network marketing company trying to share all natural health supplements. Do you suggest making own blog vs just linking to make shop site for products? Hi Kate! I love your site and your podcast! I am a very new blogger and have 6 pins on Pinterest of my own that are doing less than stellar! lol! Maybe 2-3 repins? I know that I still have a lot to learn on all sides, but my question is about stock photos. I have taken a few of my own pics, but I find SO MANY beautiful photos on stock sites that I think will perform so much better than my own pics. Is that ok? I am a bit of a perfectionist and I want the beautiful pinterest images that I would want to see in a search! Thank you so much for your time and all of the great advice!